All Roads Lead To Curves! H&N Perry would like to welcome Curves to their new address at 84 Pinjarra Road, Mandurah. Their new premises is just a short drive down the road from their previous Mandurah Forum location. Curves is a women only fitness centre that offers all women the opportunity to improve their health with a well rounded exercise program, personal coaching and healthy eating plans. They are well renowned for providing a supportive atmosphere that is both fun and focused. To complete their all round wellness centre, Curves has a fully qualified sports therapy and remedial masseuse who attends the gym on Wednesdays and Fridays by appointment. Local Mandurah owners, Christine and Riss have been helping the women of Mandurah with health and nutrition since starting their business in 2010. As an added bonus, they are offering new members the opportunity to join with absolutely no joining fee. Just mention this article to receive the offer. Curves new premises is well located on busy Pinjarra Road between Forrest Street and George Street. It’s a high profile location with large volumes of passing traffic and is easy to spot with its striking purple and white signage. Unit 3, 84 is a spacious air-conditioned showroom with 189sqm for exercise equipment, massage chairs and relaxation. We wish Curves all the best with their already successful business at their new address. H&N Perry have been experiencing a high volume of leasing inquiries recently and have been filling vacancies for all types of commercial properties including industrial, warehouse, showroom, retail and office space in Mandurah, Rockingham and Pinjarra. 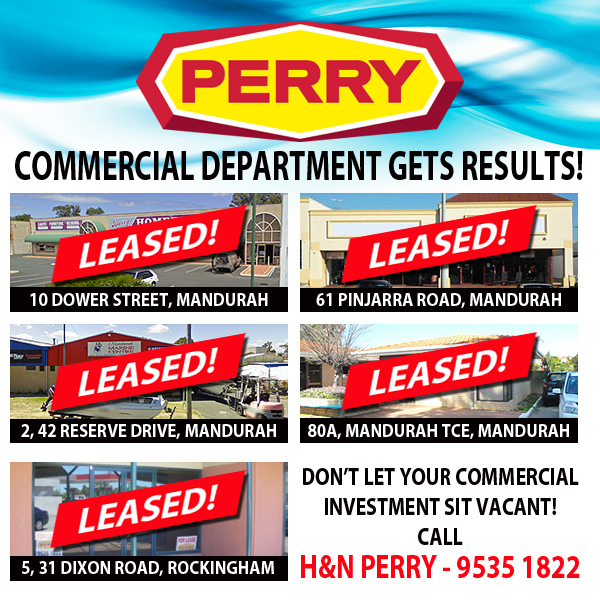 Don’t let your commercial property sit vacant, call Mandurah’s leading commercial property managers H&N Perry on 9535 1822.